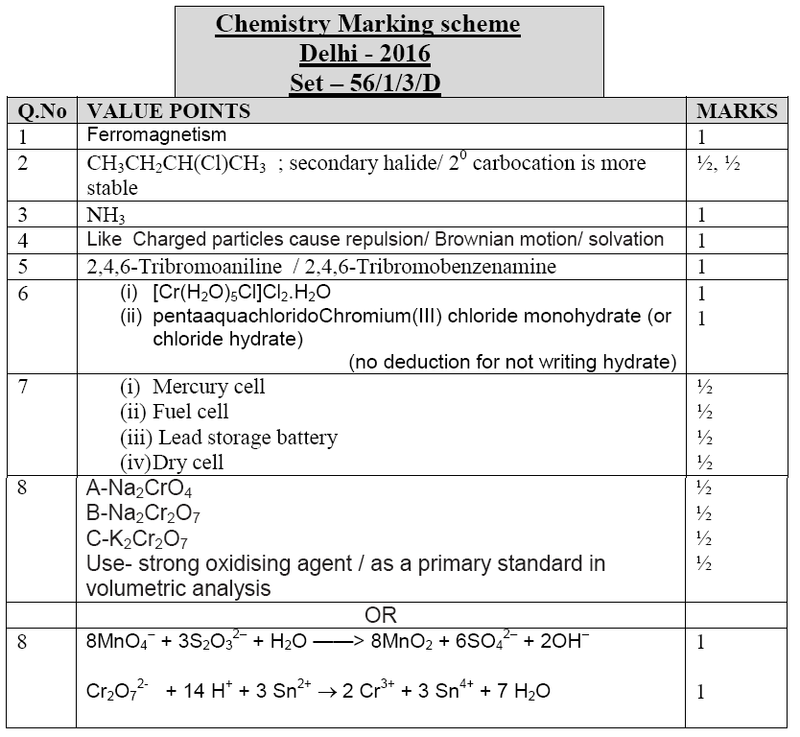 Get latest Marking Scheme of CBSE Class 12 Chemistry 2016. This marking scheme was used by CBSE board for the evaluation of the answer booklets of CBSE Class 12 Chemistry board exam 2016. Every student who is going to appear in CBSE board exam 2017 wants to score well. But only those will succeed who know how to give maximum information in a minimum number of words. In order to help the students, every year CBSE Board releases the marking scheme which was followed at the time of answer booklets correction. The marking scheme of CBSE Board 2016 is now released by CBSE board. The marking scheme is provided with very short answers (key points or value points). During the evaluation of CBSE board examination 2016 answer booklets, the answers with all key points (as in marking scheme) were awarded maximum marks. Students can refer to this marking scheme and can also take help of the CBSE Class 12 Chemistry Solved Question Paper 2016 specially prepared by Jagranjosh.com experts to help the students of CBSE board who are going to appear in CBSE board exam 2017. The link of Marking Scheme for CBSE Class 12 Chemistry Board Exam 2016: Delhi issued by CBSE Board is given below. The link for Class 12 Chemistry Question Paper (Set-3, Delhi) 2016 Question Paper is also included in this article for the convenience of students.